Tiny Dunseith, North Dakota, a town settled by French Canadians, is home to a one-of-a-kind international monument. Dunseith is the United States point of entry into a monument that marks the world’s longest continually undefended border between the United States and Canada. 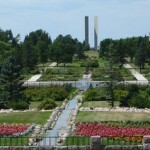 The International Peace Gardens are the only internationally-shared monument in the United States. Our leisurely drive from Central North Dakota led us past the Geographic Center of North America and the world’s largest hubcap turtle. We continued north and just before we reached Canadian customs, we turned left into the Peace Gardens. We were met by perky young greeters who welcomed us and took our $10 entry fee. They provided a map of the grounds (which include a scenic driving tour on each side of the border) as well as a number of sites to see inside the park. We parked on Canadian side, secured our car and walked up a few steps into a paved clearing. This vantage point gave us a long-view of the expansive gardens on each side of the tiny canal that runs down their center. The gently tumbling water represents (and actually marks) the US/Canadian border. We strolled up the Canadian side path past the Veterans’ Memorial Bell Tower toward Peace Tower. Donated in 1976 by four Canadian men to honor their late mother, the Bell Tower plays faintly the Westminster Chimes at the top of every hour, and is a beautiful, charming and peaceful addition to the grounds. As we meandered further back we came upon the hallmark of the gardens – Peace Towers. Made up of four stone columns, it towers 120 feet into the air. The columns themselves represent people coming from the four corners of the earth who have formed two similar, but distinct nations (Canada and the US) based on the same democratic notions. The towers cost $1.3 million to complete and were dedicated in 1983. Two of the columns stand in Manitoba while two stand in North Dakota. Of course, every visitor, including us, is required to straddle the border – ever so briefly – to show solidarity with our democratic friends. The Peace Gardens is full of surprises beginning with the Peace Chapel and continuing down the United States side with the 9/11 Memorial and Botanical Gardens. The Peace Chapel, dedicated in 1970, is made of Manitoba area limestone known as Tyndall stone. The chapel is non-denominational and is still actually used for services and weddings. The main draw of the chapel are the three walls of flat limestone engraved with dozens of inspirational quotes from the world’s most recognized people of peace. The quotes remind visitors of not only how delicate peace is, but how important it is that we continually seek common ground and common goals. The path then takes you past the 9/11 memorial that includes recovered steel beams from the World Trade towers and an interesting outline of the steps that led to the tightened customs regulations we now face. The irony of this forced border closure description at the International Peace Gardens is not subtle, and I believe is meant to show the interesting results that followed the first major terrorist attack in decades on U.S. Soil. Finally, we visited the Botanical Gardens in the Interpretive Center building which is a collection of many plants from the western hemisphere from ferns to Cactus and operates on additional free-will donations. It’s a must see if you plan to visit. There is a cafe and gift shop located in the interpretive building as well. Every American and Canadian should make a pilgrimage to this site at lease once as a reminder of the positive, almost brotherly, relationship we’ve had for over 200 years. For more information, visit here. Does this give Victoria dual citizenship? Flowers in the shape of Canadian flag. Flowers in the shape of US flag.